Are you looking for ways to turn your Facebook page into a sales machine? Do you know that Facebook can help you get more customers? Most business owners don’t have clue that it’s possible to make your Facebook page work for you. Is your goal to drive traffic to your site? Is your goal to get people to purchase? Is your goal to get more walk-ins to your store? In every goal, there’s actions to take to reach it. Here’s how. Creating a Facebook page doesn’t end there. Though it’s a prerequisite to have a Facebook page before you can start advertising, having one and abandoning, then wait for it’s own brain to do the work for you is not a good idea. It’s just as important to keep your page fresh with regular posts including tips, specials, photos, and videos. Let’s take the Revlon Philippines Facebook page as an example. Their last post (timestamp is May 26, 2017, 11:04 AM) is one hour ago which means they constantly post new updates. Protip: To make your Facebook page active, allot at least 15 minutes a day to post an update about your business. I’ve seen websites that have no link to their Facebook page. There are also websites that have Facebook page but not visible enough to locate the link. Here’s a good example from Entrepreneur website. 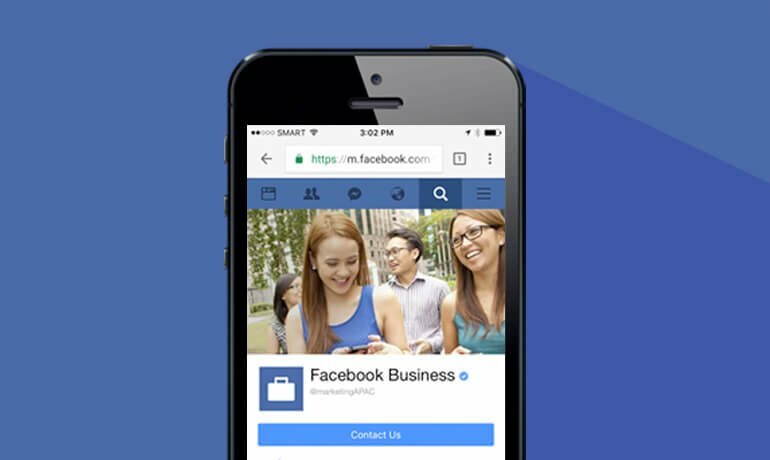 The Facebook icon is placed on the footer of the website. Even though it’s not on the upper part of the website, it’s still on the homepage. If you’re going to include a Facebook link on your email signature, you can easily do that with Wisestamp. It’s a web-based email signature creator where you can setup and design an email signature and automatically integrate it on your email. By linking your Facebook page to your website or email signature, it will increase the chances of getting more fans and engagement. Here’s a secret you won’t always see – switch your post ideas regularly! This might seem like a lot of work, but there are a few reasons why having new theme frequently can help your Facebook page. I’m sure there’s a lot of things happening on your business and sharing them with your audience is a great move. You can post about news and upcoming events, upload photos and videos, celebrate milestones, or even share links from other sources that support your business’s message. Protip: Craft posts that are relevant and valuable to your followers. To help with coming up various topics, here’s our social media marketing template you can download and use as a guide. There are many ways to measure the results of your Facebook page and it begins with one question: What’s your objective? This will help you determine if the results your efforts are driving are hitting the mark. For instance, if your goal is to increase engagement, then you may want to look at reach and engagements as an indicator of success. To do that, simply go to Insights tab and click Overview. In a simple glance, you’ll see if there’s an increase or decrease on your metrics. Let’s take Poracay Resort facebook page as an example of engagement. It shows in the image below that it’s a two-way conversation. And with the Pages Messaging feature, customers can send you private messages. You can set an automated reply or create a saved reply. Protip: Take note of your average response time to questions to keep customers informed, happy and engaged. Then, decide where you want to place your ads (news feed, right-hand column, etc. ), choose an image and craft texts for your ads. The easiest way to advertise on Facebook is through boosting a post. This features allows you to promote an existing post on your page to not only the people who like your page, but their friends and beyond. Just set your budget and target audience and Facebook will do the rest. Facebook has many ways to promote your business and get it in front of your target audience. But it takes time, money and effort to make your Facebook page work for you. If you have a Facebook page, you surpassed the first step. Following the ways I’ve mentioned above will surely help your business becomes successful on Facebook.